Justice Connect is committed to challenging and changing unfair laws which serve to lock even more people out of the justice system. When someone has a problem like homelessness, debt, or a violent partner, they probably don’t think their problem is a legal one: for them, the problem is the absence of housing, the absence of money, or a dangerous partner. But life’s problems often have a legal solution. There are as many paths from homelessness as there are people experiencing homelessness. The people who travel these paths tell stories of commitment to family, resilience and support. Read Maggie's story told in her own words. There are thousands of trans and gender-diverse young people in Australia that will need approval from the court to enter the next phase in their life. Scarlet's is one of them. Access to the treatment can not be granted through only a medical assessment. A court hearing is the only option to get to Stage 2. Sue Woodward, director of our Not-for-profit Law team, has many passions, but a consistent, modern, and fair regulatory framework for charities and community groups would have to be near the top of the list. Sue has been the engine behind Justice Connect’s #fixfundraising campaign, an effort to bring fundraising law under the banner of the Australian Consumer Law. This would save the sector millions of dollars and – more importantly – let it spend its time doing what it’s good at, rather than wasting it complying with difficult and unnecessary laws. “The current fundraising regulations are a mess. They’re out-of-date. They deal with wishing wells and the length of handles on collection boxes, but not with online fundraising and crowdfunding. Charities want to do the right thing, but it’s too complex, too confusing and it’s ineffective,” Sue said. 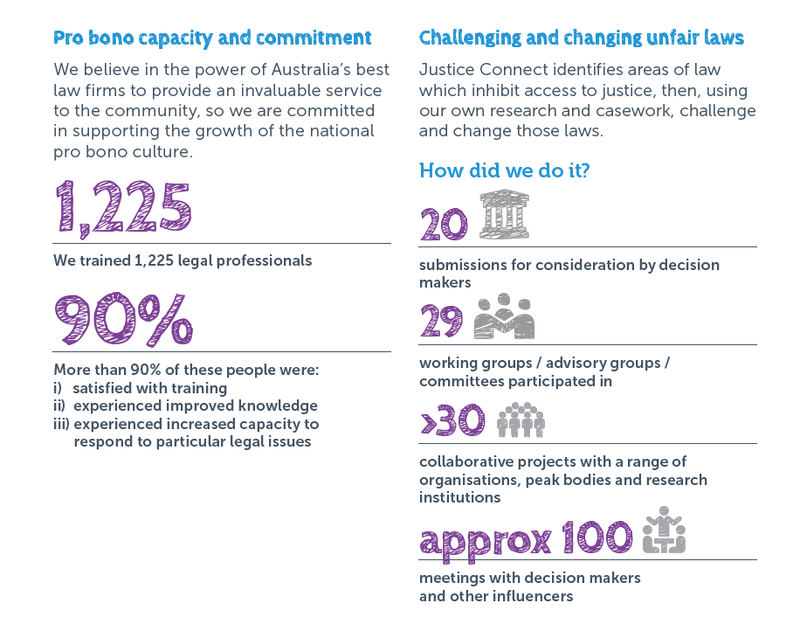 Justice Connect pulled together a powerful coalition including influential peak sector and professional bodies (such as ACOSS, Philanthropy Australia, Australian Institute of Company Directors, CPA Australia, Chartered Accountants Australia & NZ, Community Council of Australia and the Governance Institute of Australia). The #fixfundraising coalition started with a joint statement outlining how to fix this problem: changes to the Australian Consumer Law to cover fundraising by charities and other not-for-profits, the repeal of existing state-based fundraising laws, and a self-regulatory code applicable to all fundraisers. “We understand a number of state governments are agreeable to our proposal – it delivers them a national framework and is cost neutral”, said Sue. “And now is crunch time: consumer ministers are about to meet and decide how far to go with Australia Consumer Law and to fix the fundraising law mess”. "Teenagers already have enough to deal with"
In 2014, Justice Connect started receiving calls from a new kind of client. Worried parents of trans and gender-diverse teenagers were facing a seemingly absurd hurdle: in order to access vital, identity-affirming hormone treatment, they were required to obtain a court order. Being a teenager is hard enough. For children who identify as trans or gender-diverse, adolescence carries the added burden of developing physical features which do not align with the body they feel belongs to them. Young trans girls can find their voice breaking, or trans boys may begin growing breasts. The first stage of treatment often involves puberty blockers, which delay these developments. At one time, access to this first stage treatment also required a court order, until the hard work of young activist Georgie Stone saw a change in the law. Sadly, ‘stage 2’ treatment – which induces physical development in line with the young person’s gender identity – still requires a court appearance and sign-off from a judge, even when parents, doctors, and the person themselves all agree on the need for treatment. 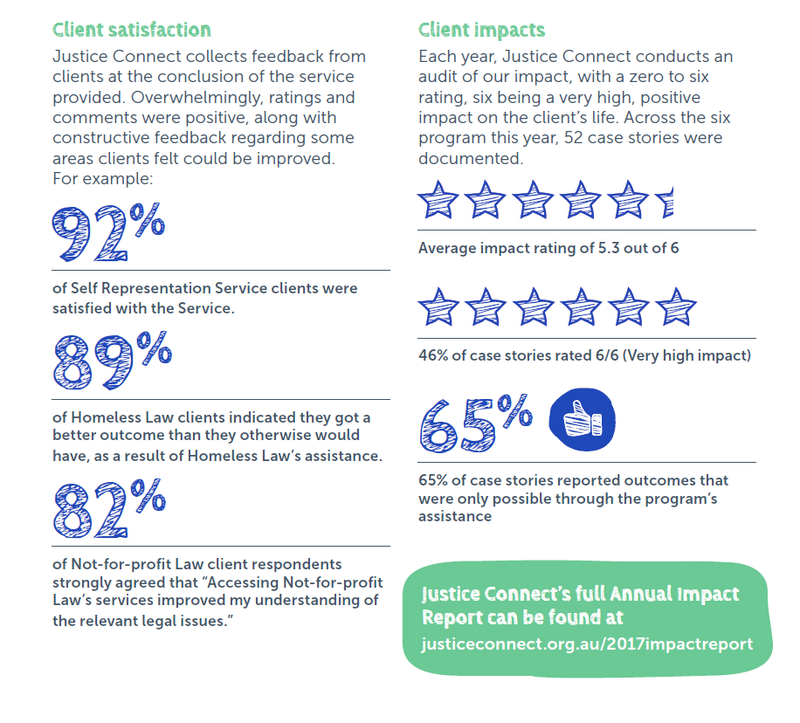 Recognising this problem, Justice Connect’s Stage 2 Access project was born. Since the first call just three years ago, we have helped dozens of families - 51 in the last financial year – and that number continues to grow. By building partnerships with the Royal Children’s Hospital in Victoria, and Inner City Legal Centre in NSW, we increased our ability to help families access representation, and alleviate the burden of navigating the court system. “Ideally, young trans people and their families shouldn’t have to go to court in the first place. It would only take a small change to the Family Law Act to remedy this,” says Edward Davis, from Justice Connect’s Public Interest Law team. “It’s hard to imagine the stress these young people must feel, knowing there is a ticking clock, and still having to ask a stranger for permission to simply be who they are,” Edward said. Justice Connect is partnering with a wide variety of organisations including Transgender Victoria, Transcend, Parents of Gender Diverse Children and the Human Rights Law Centre, to work towards change. “The coordinating role we play gives us a unique opportunity to understand and respond to any issues arising from the running of these matters. Our priority is to remove the role of the Family Court in these matters and, until then, to advocate for a more streamlined and consistent process in the Family Court,” said Edward. As many of us were easing ourselves into the New Year this January, the media began to explode with stories about people sleeping rough outside Flinders Street Station. There was relentless negative media coverage, including the depressingly titled front page article ‘Grand Slum’, referring to the Australian Open. Melbourne’s Lord Mayor was initially strong in his position, saying he had seen cities around the world that bundled homeless people up and shipped them out, and that this wasn’t the kind of city Melbourne wanted to be. Disappointingly, after further media pressure, his position changed and it was announced that the council was proposing tougher local laws to respond to rough sleeping in Melbourne.The proposed changes broaden the existing ban on camping (in which camping isn’t defined, and so includes sleeping with a sleeping bag or blanket) and create a new ban on leaving items unattended. People can be fined $250 or charged for either of these offences. People’s unattended items can also be confiscated; to get them back they will have to pay a fee. The proposed changes broaden the existing ban on camping (in which camping isn’t defined, and so includes sleeping with a sleeping bag or blanket) and create a new ban on leaving items unattended. People can be fined $250 or charged for either of these offences. People’s unattended items can also be confiscated; to get them back they will have to pay a fee. “Homeless Law knew we had to act quickly”, said Lucy Adams, manager of the Homeless Law team. “We see every day the harsh and ineffective impact of using fines, charges and move-on powers to tackle homelessness and we don’t want to see our city go down this path”. “Informed by the evidence from our work and the insights of our clients, we worked with our partners across the legal, housing, homelessness and faith-based sectors to try to prevent Melbourne going down a path that is doomed to fail”. “We wanted to highlight the risks of these laws, but we also wanted to give council constructive solutions and assure them that there is another, better way forward”, Lucy said. In a welcome development, the decision on the proposed laws, initially due in May, has been adjourned twice for further consideration of the evidence. “There is still time for Melbourne to reclaim its role as a leader in well-thought-out, compassionate and effective responses to homelessness”, Lucy said. “And we urge them to take this path”.